A new anti jet-lag treatment in the form of a vitamin drip is now available for people living and working in London. 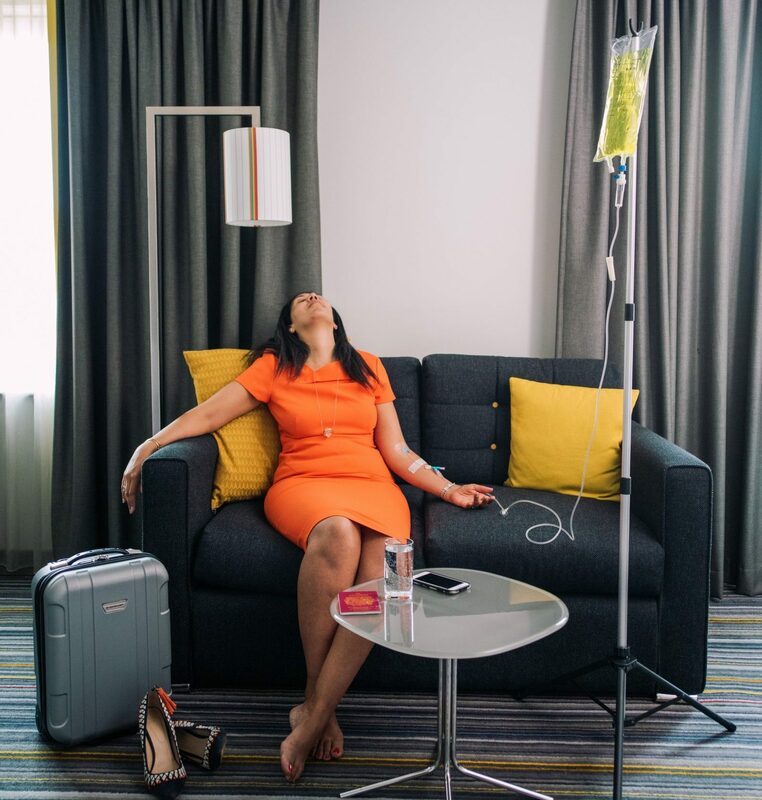 Delivered by America’s IV Doc, a leading provider of IV fluid treatments and vitamin infusions, weary travellers can be wired up to bags of rejuvenating liquid that are administered intravenously in the comfort of their own home, office or hotel room. The “Jet Lag Relief IV Hydration Therapy” package costs £449 and claims to be the “ultimate jet lag cure”. Apparently, dehydration is one of the causes of jet lag symptoms but drinking water only has a 50-60 per cent absorption rate. An IV vitamin drip will deliver “one litre of fluid, anti-inflammatories, vitamin B12 and a multi-vitamin cocktail to rehydrate and re-energise”. The IV Doc says: “IV hydration is 100 per cent absorbed, making it the fastest way to replenish needed fluids and electrolytes.” Treatment lasts 45-60 minutes and a doctor will always consult with you prior to your drip being prepared for you to ensure the optimum vitamin and hydration infusion “to deliver the very best results”. How effective IV therapy really is is debatable. A few years ago, Globetrender editor Jenny Southan tried an IV hangover treatment in Las Vegas. In a piece she wrote for Business Traveller she said: “If you’ve overdone it the night before, Las Vegas is probably the only place on Earth where you can take advantage of a medical practice dedicated to the treatment of hangovers. Certified anesthesiologist Jason Burke claims to have cured more than 10,000 people with his rehydration remedy, which involves having up to two litres of vitamin-enriched fluid (known as a Myers Cocktail) fed intravenously into your veins. “Depending on how bad you feel, you can choose from three IV packages – Redemption (US$159), Salvation (US$199) and Rapture (US$259). The last of these also includes anti-nausea medication, painkillers, 30 minutes of oxygen and an injection of B complex vitamins. Hangover Heaven has a bricks-and-mortar surgery at 3,281 South Highland Drive, and even a mobile clinic in the form of a bus that drives up and down the Strip, but the best thing about it is the option of receiving a visit from a nurse in your hotel room (US$300 per session). The ultimate hangover cure – also known as the “Deathbed Relief” – includes all three IV medications to tackle nausea, heartburn, aches and pains. This quickly rehydrates your body on a cellular level and replenishes essential minerals and electrolytes using a balanced salt solution. Improves blood supply to vital organs while purifying your body from daily chemicals you are exposed to leaving you feeling rejuvenated with a healthy glow. Recover rapidly from food poisoning – stops nausea, vomiting, diarrhoea and fever, helping you to recuperate quickly. Gain relief from a migraine attack, relieve and stop symptoms through this custom infusion of IV fluids, electrolytes and medication. A tailored IV fluid treatment with medications and vitamins to get you on the mend and bouncing back quickly. Getting ready for a special night out or a red-carpet event? This A-list celebrity treatment includes Vitamins B1, B2, B3, B5 and B6, a multi-vitamin cocktail and electrolytes to give you a healthy, radiant look. The most powerful combination when nothing else will do – a mega dose of Vitamin C, Glutathione (to neutralise free radicals) and The IV Doc Multi-Vitamin Cocktail to have you feeling fine in no time. Comprises 1 litre of fluid plus one medication – either anti-nausea, anti-heartburn or anti-inflammatory/painkiller – that the GP will choose during your consultation. A quick energising boost of gives Super Vitamin B12 to boost cell growth and development, promote good red blood cell function and help reverse fatigue. 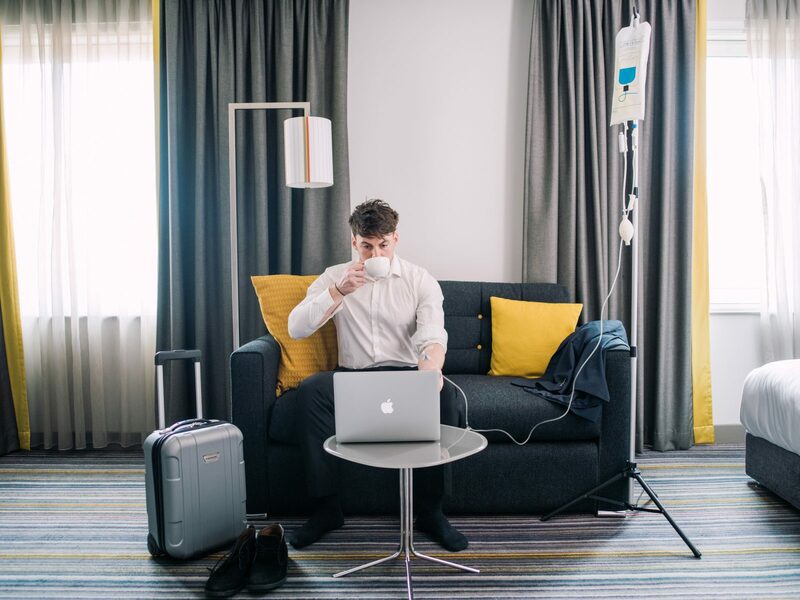 Other companies that offer IV drips for jet lag include IV For Life, Boost Hydration and The Cure LA, which is targeting festival-goers and holidaymakers.